Not all CrossFit facilities are created equal. Beacon's community supports all ages and abilities, and our coaching staff shares the common goal of supporting each individual athlete while each coach contributes their unique perspectives to that end. The majority of the coaches started out as Beacon members and they maintain this connection to the community. Figuring out what CrossFit is and how it will fit with your needs can be confusing. We will make this easy for you. You can simply contact us and a Beacon coach will follow up with you about your goals and questions, and to arrange for a free introduction without any commitment to join. Click here for your opportunity to try Beacon for free. You can also look through the advice our members provide in their own words for new people, based on their Beacon experience. Join us this Saturday from 9:30 am - 10:30 am for a free class where you will get to meet our coaches, see our facilities, work out with a variety of fun people, and try CrossFit out for yourself. We will include many of the same movements used in regular classes (e.g., air squats, box jumps, and kettlebell swings). These functional movements build core strength and conditioning but don't take extensive practice, enabling participation without prior experience. All ages and abilities are welcome. Come this week or every week! There is no limit to the number of times you can join us. Only you can determine that. 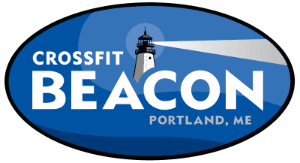 At Beacon, we make CrossFit available for everyone. The most important thing to know about CrossFit is that every facility is different, from its program to its space to its community. Beacon offers the Greater Portland community a place where all ages and abilities can come together to get fit and have fun. There are a lot of things that make us different from our competition (see the Portland-area CrossFit comparison guide). More than anything, we encourage you to contact us, or attend one of our community classes every Saturday at 9:30am, to find out for yourself. There is a lot of press about CrossFit and plenty of conflicting information. Many of us began wondering if we would like CrossFit, or if it was worth the investment. We've heard all kinds of possible concerns, including "do I need to get in shape before starting?" "What about a prior injury?" "Do I have the time?" Rest assured that we address all of these and more: our coaches are there to teach you, scale workouts to your abilities, and help you achieve new goals. Our training programs can be useful for building on high levels of fitness, rehabilitating from injuries, and building core strength. You can read about different members' experiences in the testimonials page, or follow us on Facebook, to see what others are saying about Beacon. Joining Beacon is an investment in yourself. People have come to us from the $10/month gyms or $10/class boot camps and happily paid the difference in price because they’ve gotten out of their workout ruts and are challenged every day. Other members have joined Beacon as their first gym ever because the coaches make the process less scary and more accessible. Whether coming from another gym or starting out fresh, the Beacon community is truly amazing. You will meet a variety of people with similar goals ready to help you build fitness and connections.